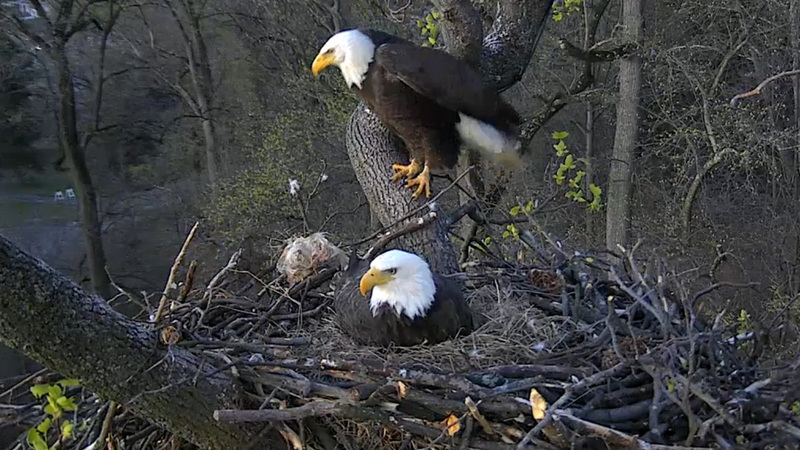 The Eaglet Is Landing: The 'Pip Out' Continues On D.C. Webcam : The Two-Way Pip pip, hooray! A hole in the eaglet's shell, called a "pip," appears to have gotten larger and the baby bird could emerge soon. The two bald eagles have been taking turns incubating their eggs at the National Arboretum, a greenspace about 2 miles from the Capitol building. 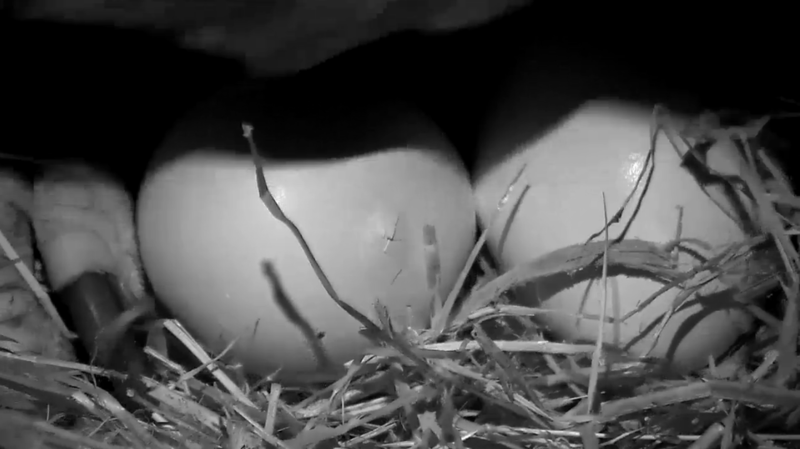 One of two eggs laid by a mated pair of bald eagles in Washington, D.C., is hatching, according to officials watching the nest at the U.S. National Arboretum. "We have a pip in process!!" said an update sent by the American Eagle Foundation on Thursday morning, which clarifies, "It's not technically a full pip until there is a full hole." The hole in the shell appears to have grown larger as of mid-afternoon Thursday, but the eaglet has yet to emerge. The group says it could take between 12 and 48 hours for the eaglet to fully emerge from the shell. A "pip," we'll remind you, occurs when a baby bird breaks through its shell using its beak. You can watch the eagle webcam online to see the young bird hatch — but be warned, the American Eagle Foundation says: "This is a wild eagle nest and anything can happen." People watching the nest online have been debating the hatch date and discussing the birds using the hashtag #dceaglecam. An egg on the grounds of the National Arboretum now shows signs of a baby eaglet trying to emerge from. The two eggs were laid on Feb. 10 and Feb. 14. The second egg is expected to hatch in the coming days. Eagles generally mate for life. They "engage in significant courtship and pair bonding behavior" and once a pair has formed they will remain together for many years. However, if a mate dies, the surviving eagle will usually find a new mate quickly. Eagles lay clutches of one to three eggs. Four-egg clutches have been reported, but this is rare. The eggs are laid one at a time with a separation of a day or two between each egg, and they hatch in the order they are laid. The incubation period for the eggs is about 35 days. The male and female eagles share incubation responsibilities, but the female typically spends more time on the nest than the male. Sometimes the female will leave the nest to hunt, at which times the male will be called upon to remain at the nest. (How very "eagle-itarian").